I love the style of Edgar Wright. It’s fast and cool, and I just love watching it. It probably comes from an obsession with his television show Spaced, and Shaun of the Dead was the first feature he made after Spaced. There are quite a few nods to Spaced in it which I also love. But to the film. Shaun (Simon Pegg) is a man in his late twenties who is stuck in a dead-end job in an electrical retailer, has a girlfriend, Liz (Kate Ashfield), who wants him to want more from his life, and a best mate, Ed (Nick Frost), who drinks and swears a lot. Then a zombie plague appears in London and they are running for their lives. 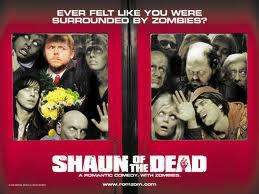 My favourite part of the film is the morning when Shaun and Ed realise what is going on. It’s just so clever; from Shaun’s hungover stagger to the shop for a soft drink (managing to ignore bodies on the ground, or zombies shuffling their way toward him) and Shaun and Ed discovering a girl staggering in their backyard (thinking she’s just extremely drunk) to the moment that they realise that something far more sinister is going on. And thank goodness that these are old-school shuffling zombies. I doubt it would have worked with running zombies. Plus, I would have been far too scared.